Wellington, Wednesday: India crashed to their worst ever Twenty20 defeat as an aggressive 84 by Tim Seifert set New Zealand up for an 80-run win in Wellington on Wednesday. 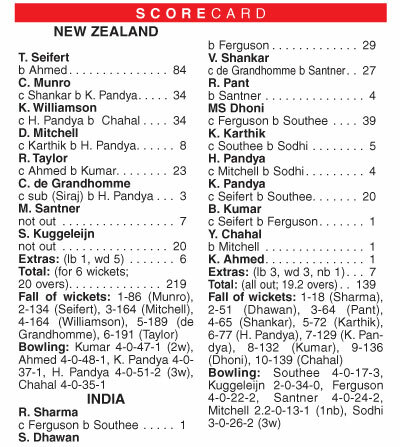 Williamson added 34 to the New Zealand cause and there were enterprising cameos late in the innings from Ross Taylor with 23 off 14 and an unbeaten 20 from seven deliveries by Scott Kuggeleijn. Faced with batting at 11 an over, India faltered from the start when Sharma went for one.